He had served throughout the war and had continued to serve with the army of occupation in the Tyrol. He died in an accident on a mountain peak. He was the holder of the Meritorious Service Medal award for ‘Meritorious service by those military members who are of irreproachable character with at least 20 years of service and already holding the Long Service and Good Character medal’. 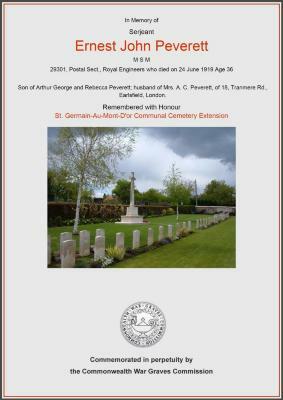 He is buried at St Germain-Au-Mont D’Or Communal Cemetery Extension, North of Lyons where he is remembered with honour. He is commemorated on the memorial in the Free Church.